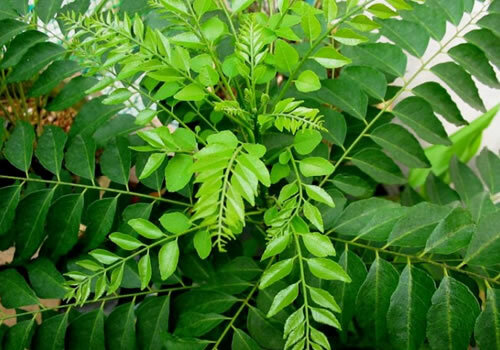 Curry leaves health benefits also include relief from kidney pain, treatment of minor superficial skin injuries, and managing diabetes. The bark and root of the curry leaves plant is believed to hold medicinal properties as some herbalists claim that the powdered form of the bark and root can be used for a variety of disorders including treating diabetes; however further research is needed to verify these claims and hence diabetes patients must not rely solely on curry leaves as a form of treatment. Curry leaf health benefits also include reliving related to the kidneys. Bilious vomiting can be controlled with the help of the bark of the curry leaves tree. Take some dry bark and make a decoction with cold water and give this to the patient for quick relief. Curry leaves can be quite beneficial for your hair as well and when boiled in cow’s milk provides relief from skin infection and heat rash. You can also grind it into a fine paste and add a little bit of turmeric on it. Mix lime juice, honey or sugar crystals to the juice of curry leaf and drink it. This prevents nausea and dry vomiting. For Hair: Heat oil and add some curry leaves. When the curry leaves turns dark black remove the oil from heat and let it cool down. Store in a glass container. Apply this oil on your head and leave it overnight. This helps prevent premature aging of grey hair and also nourishes the hair roots. This oil also acts as a very good stimulant and helps in hair growth. Mix curry leaf with finely chopped ginger. Mix it with rice and take it early in the morning instead of water which will reduce dizziness, stomach disorders and constipation. Grind Curry leaf, black pepper corns, dried ginger, little cumin seeds and salt to a fine powder . Mix it with rice, make two small balls and eat it.